FEB 26-27, 2018. 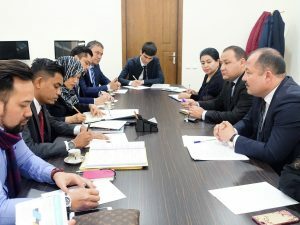 Last days of the winter has brought a huge opportunities to partner universities – Sultan Idris Pedagogical University (Universiti Pendidikan Sultan Idris, UPSI) and UzSWLU, which was achieved with the help of the Embassy of Malaysia in Tashkent, Uzbekistan. Now the sides will work closely, promoting of teaching and learning foreign languages, both in Uzbekistan and Malaysia. Universiti Pendidikan Sultan Idris has provided the university with the equipment, books and literature, as well as sent specialist on Bahasa Melayu – Mr Mohd Faiz bin Idris (Fakulti Bahasa dan Komunikasi), who will conduct the lessons for the UzSWLU students.